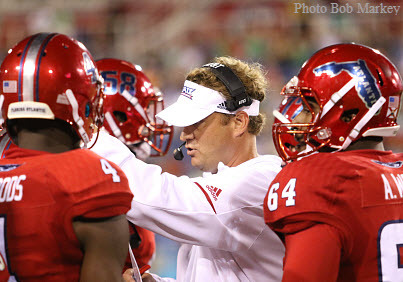 Florida Atlantic Head Coach Lane Kiffin talks about the Knights, the Owls' defense, approaching the shortened week, and offensive line cohesiveness. What do you see from UCF Quarterback McKenzie Milton? Really great touch. Makes a ton of plays out of rhythm, scrambling around. Really, really special player making so many plays down the stretch (in) some tight games where he made some huge plays. Would you have wished the team duplicated that first quarter last night in the other three or are you kinda happy that you have something that you can get on your team about going into UCF? That would have been 116-0, so that would have been a record. I would have liked to see us play better with the backups in there, and cleaner, but the flipside of that is, you don't have to worry about over-confidence and it makes guys realize what they have to work on. The defense has struggled with scrambling quarterbacks so far this year. How confident are you with the defense going into the UCF game and your front seven? This obviously is a tough guy to contain and a tough offense. They are second in the country in offense or something like that. They go up extremely fast and he is a really special player and they are really good all around him. I told the staff, after watching these guys, both sides, I feel like we are playing a SEC team, height, weight, speed, the size of the guys and stuff is like playing a SEC opponent. How do you guys approach the short week, this week? We're going to actually go tomorrow (Monday) a little lighter than what we were initially going to do. Just knowing obviously they are going to be really fresh. There will probably be a lot of plays in this game, with their game being canceled. They are all rested up. We are going to try and limit how much we practice to make sure that we have our legs. Is it a big advantage for them to have had this time off or were you able to get some extra time and extra game in with a young team to work out kinks? I'm sure they were glad that game was canceled. Ours worked out well from the standpoint of being able to get to play a lot of backups and getting some experience for them. I'm glad we had it. With De'Andre Johnson and how well he has played off the bench both at Oklahoma and again last night, is it frustrating that you can't work him into the gameplan like you can a reserve running back or skill player? No. He has done well both games. I was really excited for him last night to have a significant play like that after everything he has gone through. It's not frustrating, we're just happy that he is playing well. In talking to an offensive lineman last night, he mentioned that the communication is not where he thought it would be. Why do you think it has taken this far into the season for it to develop and how do you think that can be fixed moving forward? Well, because the guys the year before had played a ton of snaps together. The centers and guards, and all spring together. We have a center and right guard that just got here. We didn't have a spring with them. That is a very unusual circumstance, so I would anticipate that improving. What does Chris Robison need to do to have a sound game this weekend? He is going to have to calm down and be under control a lot more like he was in game two. He was too fast with everything in game one, missing things and trying to speed up everything. He is going to have to play great for us in this game because obviously those guys are really good. There is a reason they having the longest winning streak in the country. They were a lot better on defense than they got credit for because the yards were up there, because they play so many snaps. Outside of that last Memphis game, there was a lot of games where people weren't scoring a lot of points against them. What would it mean if you guys went in and broke the winning streak? It would mean we would be 3-1, which would be good. It would be tough to beat these guys anywhere, especially there, a very loud environment. They are playing as well as anyone in the country and they are rested up and the fans are excited because it is an ESPN game on Friday night. It is all lined up. They are playing really well. We are going to have to have a great week of practice. Do you get a feeling that this is the non-conference game (in-state rivalry) that your team has been looking forward to the most? I would have to ask them. I would guess so. Logistically, I'm sure they know some of the kids and stuff. UCF being the reigning National Champions I'm sure that is intriguing to them.